‘My WEDC’ Portal to provide access from any web-enabled device to a world-renowned collection of resources in the water and sanitation sector, including publications to download, online eLearning courses and much more. 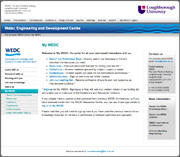 Bespoke website including interactive abstracts database, and conference and membership management system. System developed to provide services to the voluntary and community sector, and to manage their membership, mailings and events. Online decision-making tools for the construction industry, and other resources and publications.